Martha Stewart and Cooking Teens Magazine. 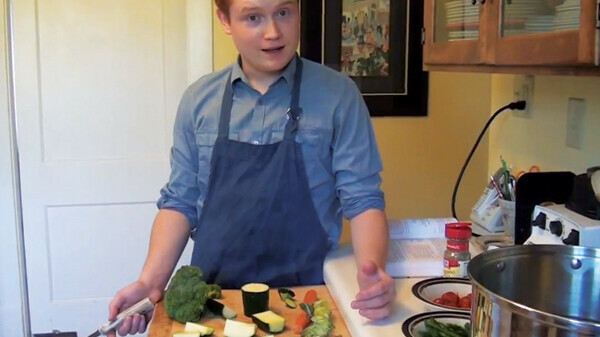 With some additional filming help from his other sister, Annisa, who used their home video camera, and some basic editing done on iMovie, “Joe’s Kitchen” made its YouTube debut on what would have been Julia Child’s 100th birthday – August 15, 2012. By 1am on August 16, it already had an incredible 1.2 million views. You may be wondering why or how that is possible. Even Joe himself had a similar response, describing his instant popularity as “kind of crazy,” going on to define it as “just luck” and “the perfect storm.” Joe was notified via a text from a friend that he was blowing up in the world of YouTube. He describes his initial reaction to the bulk of viewers and acknowledgment: “My jaw dropped and I started laughing. It was kind of surreal.” One of the major reasons for the massive amount of YouTube views, aside from his charismatic personality and comfort in the kitchen, may have been the recognition it received on Twitter the very same day that it was posted. In honor of celebrating Julia Child’s birthday, her official Twitter page shared the “Joe’s Kitchen” video, allowing it to be seen around the world by millions of people. It is now up to almost 3 million views on YouTube and Joe has since posted four more episodes. He’s also been bombarded with emails from various talent agencies and TV networks (including Martha Stewart’s publicist), become a contender for Volume One’s “favorite local celebrity,” and been featured in Cooking Teens Magazine. With so many views, Joe was bound to experience some heckling, all of which he takes “with a grain of salt.” Literally. Because of his insanely ridiculous instant success, his plans to enter UW-Stout in the fall as a business administration major have already been altered to focus on a food communication major instead. Although he still plans to attend college in the fall, he is keeping his options open and intends to continue “Joe’s Kitchen” from whatever space is available in the dorms. His immediate plans include filming his next episode of “Joe’s Kitchen,” in which he hopes to focus on healthy food options and incorporate the health supplement Akea into some fruit smoothies. In addition, on October 14 in Carson Park around 1:30pm, Luginbill will be the emcee for Cropwalk, an interfaith community event that aims to combat hunger and raise money for farmers, Feed My People, Church World Service, and other hunger-fighting organizations. Now that Joe has gained the attention of over two million people worldwide, he hopes that he is “in position to use that for the greater good.” Everyone should keep an eye on where Luginbill shows up next because it looks like his success is only going to spread from here.